Union Minister of State (I/C), Ministry of Tourism, Government of India, KJ Alphons arrived in Sikkim on Monday to inaugurate the Swadesh Darshan project in Gangtok. The Union Minister is on a three-day visit to the State of Sikkim. The Minister was received at Pakyong airport by Chief Administrator, Government of Sikkim, Smt R.Ongmu and senior officers of the State Tourism Department. 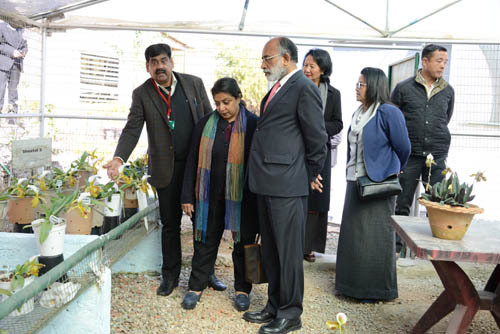 Thereafter, the Minister visited the Orchidium (Orchid Research Centre) at Pakyong, before proceeding towards Gangtok. On January 30, the Union Minister will attend the inaugural function of Swadesh Darshan – 1 Project under Sikkim at Zero Point Gangtok, along with Chief Minister of Sikkim Pawan Chamling. Swadesh Darshan Scheme is a Government of India initiative that aims to adopt an integrated approach by providing engaging experiences for domestic and international tourists through theme-based tourist circuits. The Centre aims to develop a tourist circuit in Sikkim which supports communities, provides employment and fosters social integration without comprising upon the environmental concerns and provides unique experiences to the tourists.